San Marino versus Azerbaijan may not be the sort of fixture that gets the average football fan's pulse racing, but the opening fixture of both teams' World Cup qualifying campaign was seen by many as the best chance for San Marino to get some points on the board in what will surely be a testing set of matches for the tiny republic. 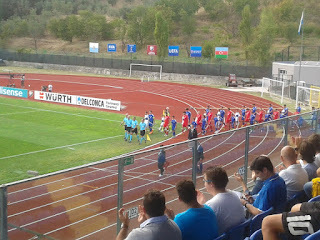 Certainly, the match (which took place on 4 September) attracted over 800 locals, around 30 Azeri supporters and a smattering of foreign-based bloggers, journalists, groundhoppers and the curious, many of whom were present to find out whether San Marino could create a chunk of football history. Plus, of course, the tiny Italian-based San Marino fan club, the Brigata 1 Mai Gioia were, as ever, in attendance and in good voice. It was the Azeri contingent who had more to shout about in the early stages, though, as their team set about putting their stamp on proceedings, with Afran Ismayilov testing the home side's defence early on. 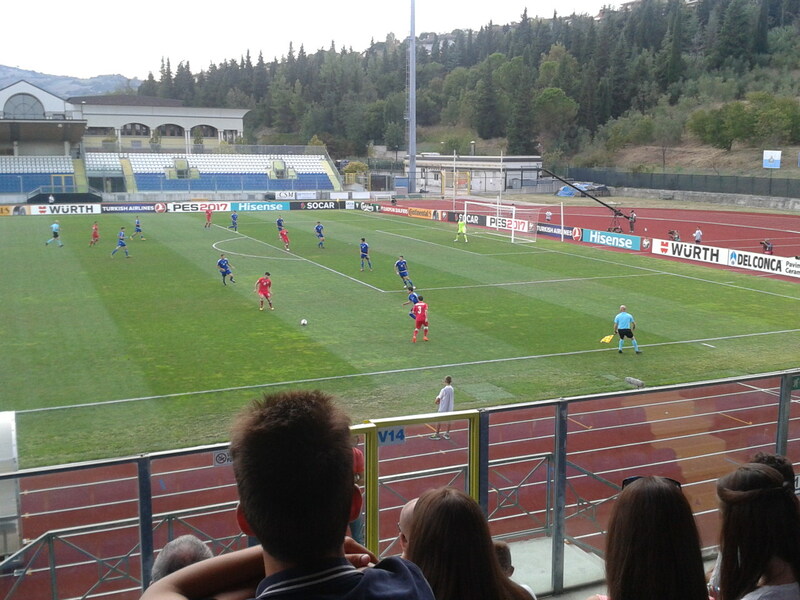 It was he who let fly with the first shot of the match after 12 minutes, an effort from the left-hand side of the San Marino penalty-area which goalkeeper Aldo Simoncini was more than equal to. Agabala Ramazanov sent a low dangerous ball across the penalty-area moments later as Azerbaijan cranked up the pressure before Dmitri Nazarov bulldozed his way through the locals' defence only to blast his shot well over the bar from more than 20 yards out in the 21st minute. The Brigata were encouraging their heroes at every opportunity, and Mirko Palazzi was busy paying them back in full with a gritty display in midfield, stopping Azeri progress in its tracks at every opportunity. Captain Matteo Vitaioli was also setting a fine example, flying into tackes with (at times, too much) enthusiasm, so much so that it would surely only be a matter of time before he landed himself in hot water with Belgian referee Sébastien Delferière. Nazarov proved that not all of his shots are of the wayward variety, unleashing one as the half-hour mark approached which brought the best out of Simoncini, who leapt like a cat to his left to paw the ball over the bar for a corner. San Marino were all the while trying to go forward; Vitaioli went on a promising-looking sortie from midfield but support was too late in coming and the chance was lost. A nice move out of defence from the hosts ended well inside the Azeri half when Filippo Berardi's cross-field pass ended up going out between José Hirsch and Nicola Chiaruzzi. The Sammarinese had the bit between their teeth, and Vitaioli got forward once again, and succeeded in winning a corner for his team. He took the corner and sent the ball into a crowded box; it reached the unmarked Luca Toni at the far post, and it would've been easier to score than to miss. However, the ball merely grazed Toni's forehead before flying wide, much to the dismay of the up to then generally sedate home support. 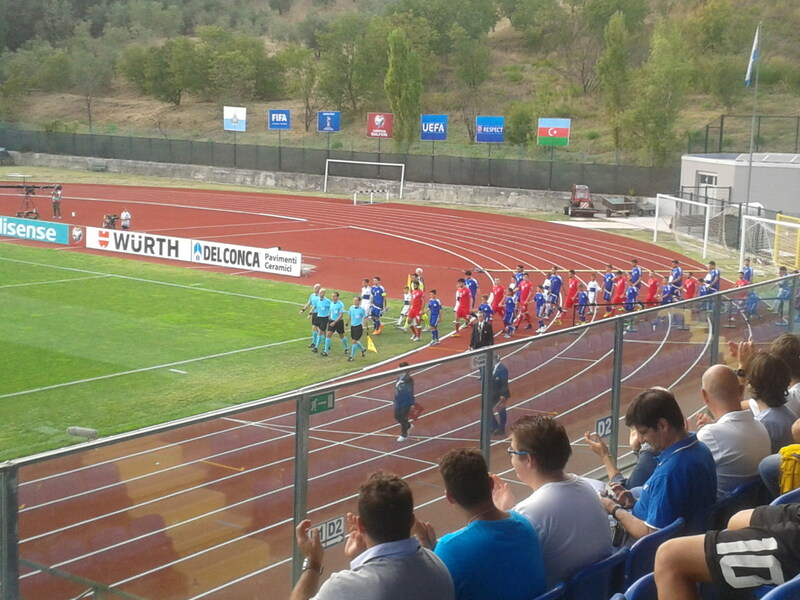 San Marino do not generally get many chances in an average match, and that was one that went begging. Up the other end went the ball once again, and Ismayilov's mishit shot careered off the ground but Simoncini blocked well at point-blank range. Vitaioli eventually got yellow-carded for flicking back his foot to impede an opponent's progress. 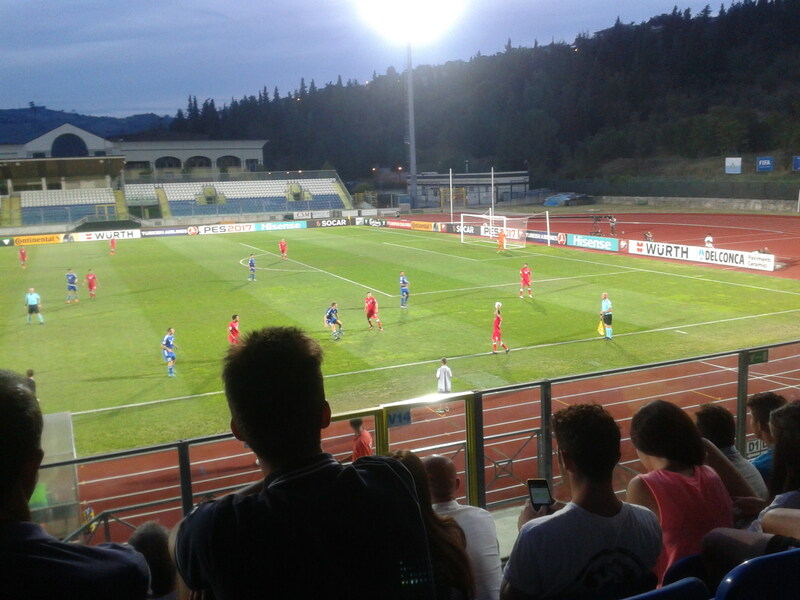 The visitors won a free-kick some 25 yards out seven minutes before half-time in a position central to San Marino's goal; Dmitri Nazarov struck a low, skidding shot which bounced off Simoncini's right-hand post and out for a goal-kick. 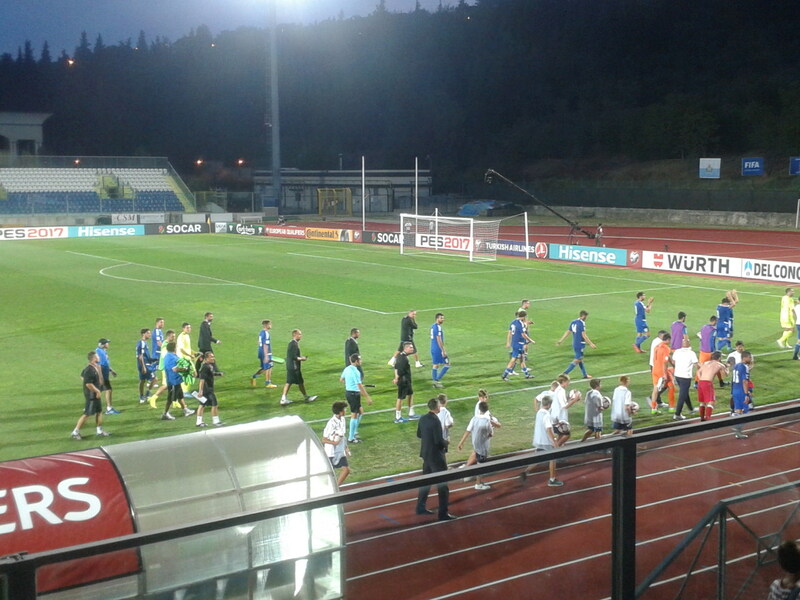 Ruslan Gurbanov sent in a tame shot which was gathered easily by Simoncini, while Hirsch had a shot blocked and a header off target for the hosts as the game meandered towards half-time. With a minute to go, neither side had really shown much of a willingness to score - Amirguliyev's free-kick excepted - when Magomed Mirzabekov and Ismayilov combined down the wing, Ismayilov sent over a cross into space and Gurbanov beat Davide Simoncini to the ball and delivered a powerful header low to the left of Aldo Simoncini to give Azerbaijan the lead with seconds to go in normal time in the first-half. The visitors deserved their lead at half-time but did not greatly impress, having been harried and harassed at every turn by a resolute home defence; at the other end, Vitaioli was constantly trying to make inroads on his team's behalf but was receiving little or no support. After Christian Brolli cut out a low cross from Gurbanov at the start of the second half, San Marino went on the prowl, attempting to find a way forward. Vitaioli and Filippo Berardi constructed a threatening-looking move which foundered some 25 yards from goal. The home team were looking comfortable and more than holding their own when, five minutes into the second half, Brolli felled Gurbanov with a late tackle, clipping his heels, or so the Azeris claimed. As the Azeri continued to roll and roll and roll, clutching his knee (of all body parts), Delfrière had no hesitation in pulling out his red card for a tackle which merited a yellow at worst due to its tardiness. Having said that, action replays of the incident suggest that Brolli did not actually make contact with Gurbanov; there might be a case for an appeal against Brolli's suspension for the game in Northern Ireland next month, if the FSGC haven't already investigated the possibility. 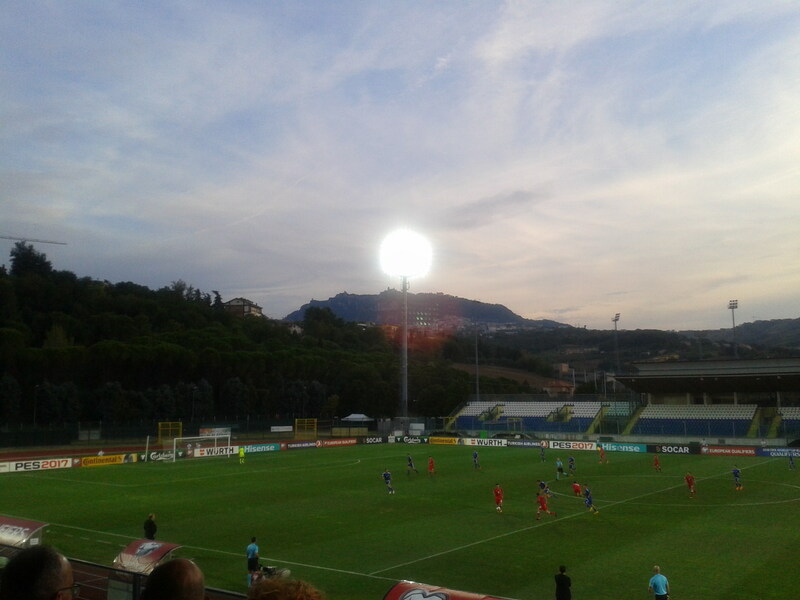 Anyway, with 51 minutes on the clock and San Marino a goal and a man down, an already difficult task for Pierangelo Manzaroli's team was now looking Herculean. It was made worse when Nicola Chiaruzzi was injured moments after Brolli's expulsion; there was a lengthy delay before he was eventually replaced by Lorenzo Gasperoni. 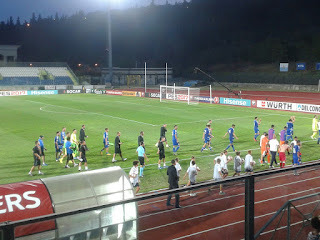 Azerbaijan upped the pressure thereafter, and, in quick succession, Gara Garayev fired just wide from the right of the penalty-area, Ismayilov curled a smart free-kick around the defensive wall, but Simoncini was down just as smartly to palm the free-kick away for a corner, and Maksim Medvedev delivered a soft header which was meat and drink for the San Marino custodian. The chances kept coming for the away team: Medvedev's 64th-minute shot was deflected over the bar, Ramazanov danced down the left wing and sent in a cross which evaded everybody and Amirguliyev headed wide when it would have been easier to plant his header on target. As the game entered the last twenty minutes, the home crowd became increasingly silent and the home side began to tire. It was as if Ramazanov took pity on them when he failed to connect with an excellent cross from Garayev with the goal wide, wide open. Amurguliyev shot low and inches wide as the visitors aimed to augment their lead; he, Ismayilov and Ramazanov were involved in just about everything Azerbaijan created and the three of them were running the show, taking it in turns to bamboozle the San Marino defence. Ismayilov then attempted to fashion another chance from a counter-attack with a few minutes left, but the final ball was loose and eventually cleared. 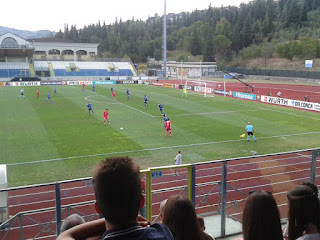 As the player escorts and the Brigata were busy making a racket on behalf of the San Marino side and Pierangelo Manzaroli was becoming more and more animated on the touchline, the team were still doing their darndest to bring the scores level via Tosi, Hirsch and Vitaioli, but the Azeri defence was equal to them. Vitaioli had run himself into the ground for the hosts and had been substituted by Carlo Valentini with five minutes left. Ramazanov was substituted by Ramil Shevdaev with two minutes left and left the field to a deserved standing ovation from the away support. Shevdaev was involved in the action almost immediately when he was on the end of a move down the right involving the impressive Mirzabekov and Ismayilov. Ismaiyilov passed to Mirzabekov on the edge of the penalty-area, Mirzabekov completed the one-two before Ismayifov stroked the ball forward to Shevdaev, who had beaten the offside-trap and was in space at the edge of the six-yard box; unfortunately for him, his attempt to dink the ball round Simoncini with the outside of his left foot went just the wrong side of the post. A minute into three minutes of injury-time, Azerbaijan had the chance to make the game safe when they once again went on the counter-attack, led by Ismailov, and he delivered a slide-rule pass to substitute Namik Alaskarov, who was in enough space on the left-hand side of the penalty-area for a road-train to make a three-point turn, and had enough time to make the three-point turn himself. There will scarcely be a better chance for anyone, anywhere, to score during the entire World Cup qualifying campaign, but Alaskarov sidefooted the ball wide from ten yards out. Azerbaijan deserved the three points, but there will be a lot of things for manager Robert Prosinecki to ponder ahead of their next World Cup qualifier, at home to Norway on 8 October, with the inability to score not the least of them. Ismayilov, Mirzabekov, Ramazanov and Amirguliyev were outstanding for the team, and it remains a surprise that the skilful Ismayilov in particular has not been given the chance to play club football at a higher level. For their part, San Marino kept plugging away, but their task became more difficult after conceding a goal so close to half-time when their defence had been showing so much grace under pressure throughout the first half, and next to impossible following Brolli's unfortunate red card. Aldo Simoncini, as always, excelled, whilst the combative Vitaioli had performed a captain's role to its limit and beyond. 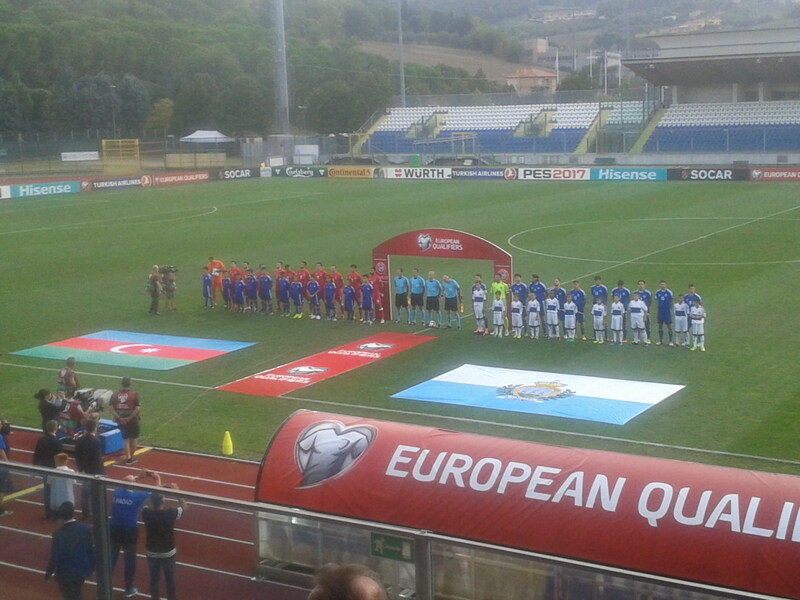 No other European team will put in as much effort as San Marino during the qualifying campaign for, presumably, so little reward - and they could do with better backing from their supporters; it's amazing what a difference even a hundred vocal supporters instead of just twenty makes - but there is always hope. A trip to Belfast next month to take on a Northern Ireland team still buoyant from its adventures at Euro 2016 beckons. It will be a difficult proposition for Manzaroli's team, at best, but, according to the San Marino manager, they will still go into the game at Windsor Park with a "positive" attitude. They will need to keep positive throughout the qualifying competition; there will be more fearsome tests to come than Azerbaijan. AUTHOR'S NOTE: Many thanks to the matchday staff at the Stadio Olimpico/San Marino Stadium for their assistance. Local daily La Serenissima was consulted to confirm some of the information contained in the above article. All photographs are author's own, and may be used with the usual provisos: acknowledgement of source and provision of copy of article.